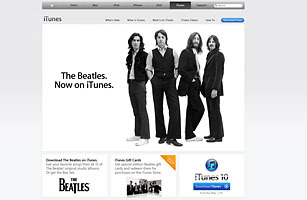 The Beatles finally came to iTunes on Nov. 16, putting to rest nearly a decade of legal squabbling. Sure, you can now buy all 13 of their studio albums, plus several compilation records  but you already have those. (Don't you?) Instead, might we suggest giving one song, either as a thoughtful token to a longtime fan or an introduction to those dozens of people in the world who aren't familiar with the band. "Norwegian Wood", perhaps? At one point in the song, Lennon sings about lighting a fire; that sounds sort of festive and wintery. Think of it as a digital stocking stuffer.